An account of the history of the Spanish colony in the Philippines during the 16th century. Antonio de Morga was an official of the colonial bureaucracy in Manila and could consequently draw upon much material that would otherwise have been inaccessible. His book, published in 1609, ranges more widely than its title suggests since the Spanish were also active in China, Japan, Southeast Asia, Taiwan, the Moluccas, Marianas and other Pacific islands. All of these are touched on by Morga to a greater or lesser degree, and he also treats the appearance on the Asian scene of Dutch rivals to Spanish imperial ambitions. 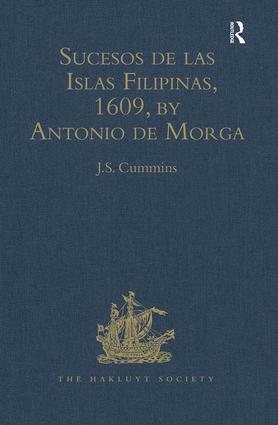 In addition to the central chapters dealing with the history of the Spaniards in the colony, Morga devoted a long final chapter to the study of Philippino customs, manners and religions in the early years of the Spanish conquest. From the first edition, Mexico, 1609. A new edition of First Series 39.